For most folks, a voodoo doll conjures up images of melted wax and evil people with chips on their shoulders sticking pins in ugly and crude little representations of people in an effort to hex their ex or get that lover back. But doll magic has existed since the dawn of civilization, from ancient Greece and Egypt, to Europe and South America, and even in China and Japan. Yet, it is the American Voodoo doll - typically the kind tourists pick up as a warm and fuzzy reminder of a vacation to the Big Easy, aka New Orleans -that gets all the attention. But as you will see, there is so much more to doll magick than one could ever imagine, and lucky for us, there's a museum to show it. While I have a vested interest in the Voodoo Doll Museum as owner and curator, people from all walks of life are drawn to the strange and sometimes beautiful dolls that grace its pages. I have long studied, made and collected these dolls, and over time received many calls from people who believed they were in possession of a cursed doll of some sort. I offer to take it off their hands and either dispose of it in the proper ritual fashion, or more often than not, keep it for my ever growing collection of cursed Voodoo dolls. They are made from a variety of substances, including the typical New Orleans sticks and moss, to the European poppet, the wooden African puberty rite fetishes, wax dolls of witchcraft, and a creepy ant bed doll made in the Southern Hoodoo tradition. The latter doll I photodocumented and wrote an in-depth article about in Hoodoo and Conjure Quarterly, Vol 2. The first thing you will notice when visiting the site is the very different types of voodoo dolls on display. While not all of them are technically "Voodoo dolls" - as in the much misunderstood ritual tool of the New Orleans Voodoo religion - they have all been ascribed some sort of magical quality about them that qualifies them for inclusion in the collection. And, it may interest the reader to know that the term "voodoo doll" is a commonly accepted term in academia to describe dolls used in magic across cultures. The term first appeared in an academic context of an article examining magickal dolls in antiquity, including the discovery of the Greek kolossoi which are ritual effigies found alongside the curse tablets of ancient Greece (see Faraone, 1988). Faraone's study was significant in the world of archeology in that it explored the discovery of 15 archaic Voodoo dolls in Greece, nine from Sicily and Italy, four from North Africa, seven from Egypt, three from the Near East, and one from the Black Sea (Ankarloo, et al. 1999). These dolls were found in graves, sanctuaries, bodies of water, a riverbed, and a sewer, among other places. But enough history, let's take a look at some of the dolls on display and some that are not yet on display but soon will be. The fact that there are many specimens in the Cursed Voodoo Doll collection is demonstrative of the ingrained idea of a Voodoo doll symbolizing pure evil in the collective psyche of society. Surely, they provide a glimpse into the word of the supernatural - for some, this is a frightening glimpse and for others a fascinating one. Thanks to Hollywood, sensational novels and shocking tabloid reports, images of ugly pin-sticking dolls used for hexing your neighbor, summoning evil spirits, and worshipping Satan makes the voodoo doll the fall guy for everything gone wrong in a person's life. There is a huge psychological component in both the use of voodoo dolls as well as in posessing one or merely observing one. For example, the Brat doll in the Cursed Voodoo Doll Gallery was found strategically placed near a man's car, facing it as if it were pointing at him. At least, that was the man's psychological reaction to the doll. Upon analyzing the doll, his conclusion was probably not off base. The fact that the doll has no feet (done to render a person immobile) and the painting of the face black as a projection of an act of black magic, and the fact that the doll was placed in the position of facing his car are evidence of magical foul play. But, it is really the last doll, the Mississippi Death Doll, that is the most interesting one. 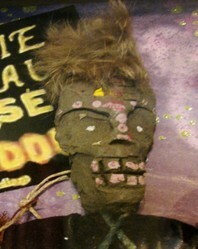 Check out the You Tube videos to witness their creation and application in the Southern conjure tradition called Hoodoo. Bless your salt by praying the 23rd psalm over it. Put your salt in a clean bowl and add the fresh basil by gently tearing the basil and mixing it gently with the blessed salt. Draw a warm bath...not too hot...just very warm. Toss the blessed salt and basil in the tub of water and swirl it around counterclockwise to mix it with the water. Place the white candle on the edge of the tub or somewhere safe in the bathroom and light it. Get in the tub and soak for about 5 to 10 minutes. Do not take a soap bath at this time. This bath is for clearing any negative residual energy you may have and for clearing your thoughts. While you are soaking, you can say a heartfelt prayer of your own. After soaking for no more than ten minutes, pour some of the water over your head seven times. You may say the 23rd psalm again at this time.Get out of the tub and take a little olive oil and anoint your head, heart, hands and feet. Allow yourself to air dry. Let the tea light burn out and sleep in clean sheets, white preferably. Nice article and presentation. Thanks for sharing!